I’ve been using a Keurig for a years. 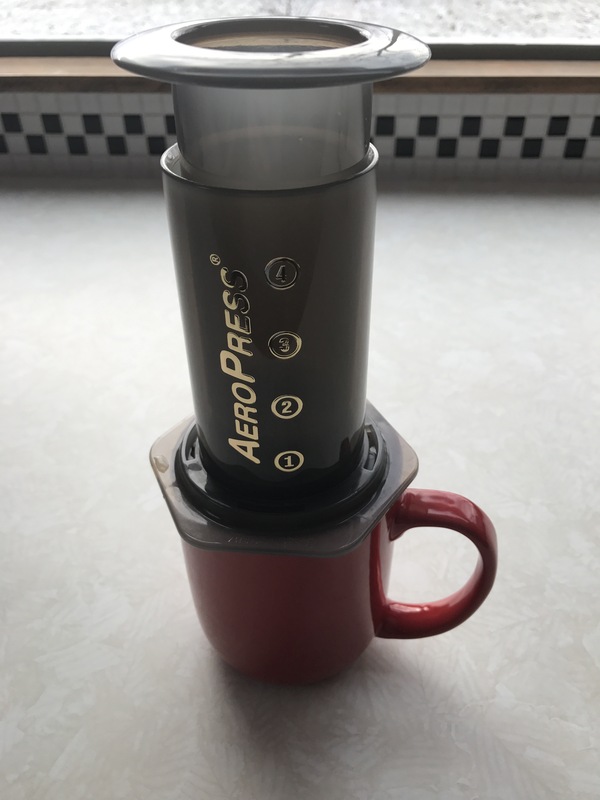 It’s fast, easy to use, and I rarely want more than one cup of coffee. During a trip to Puerto Rico a few years ago, we made coffee using a French Press and I’ve never been able to forget about it. The flavor and experience was completely different. 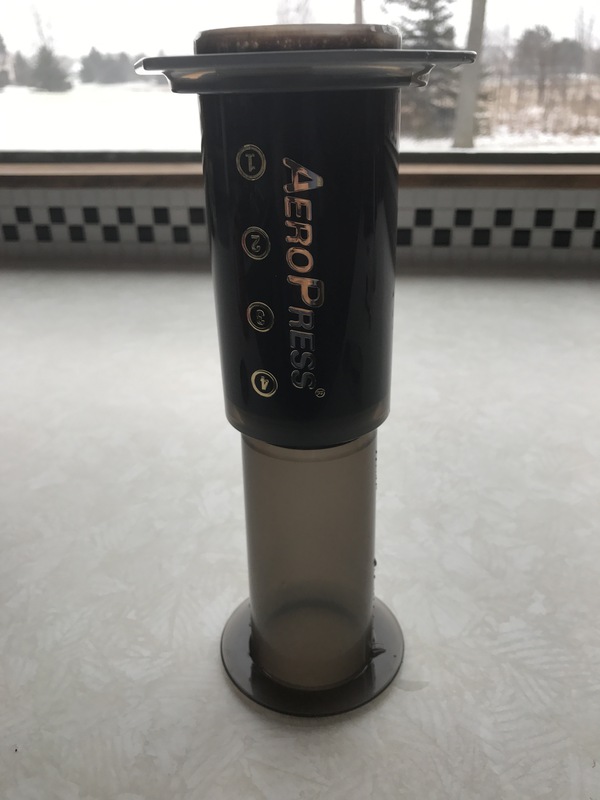 I have a hard time coming up with a Christmas list anymore, so I asked for an AeroPress this year and got it. I’m really enjoying my new morning ritual. 1. 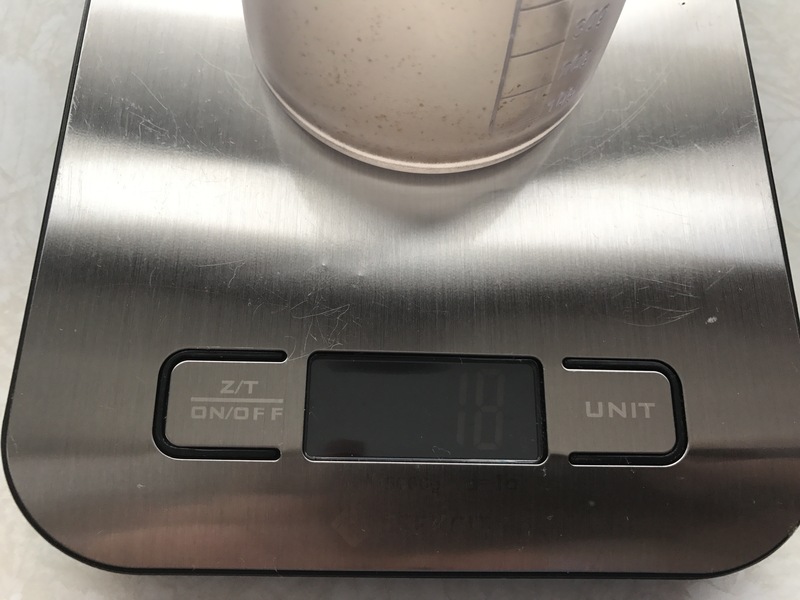 Measure out 15-18g of coffee beans. 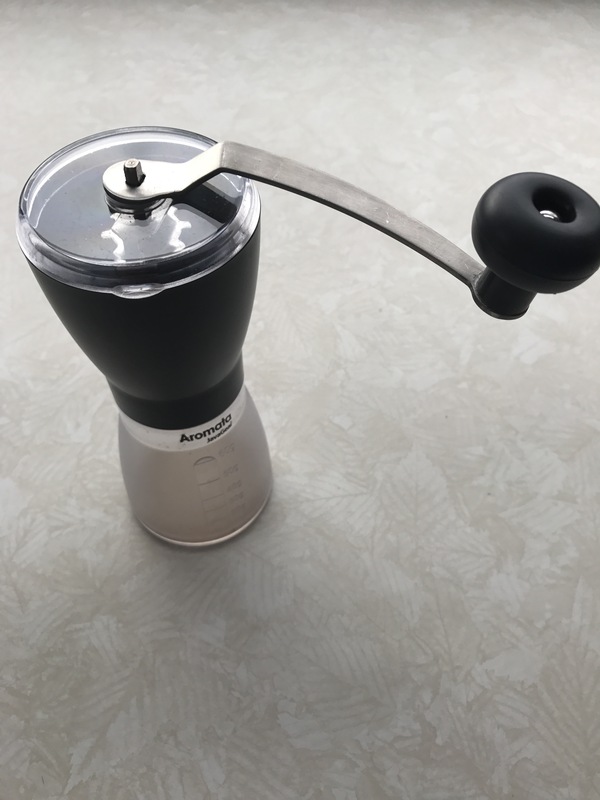 This JavaGear Aromata Grinder works well and is easy to do while the water is heating up on the stove. 3. Insert the plunger, flip it over, and dump in the coffee grounds. Fill with water, stir, and let stand for 1 minute. 4. 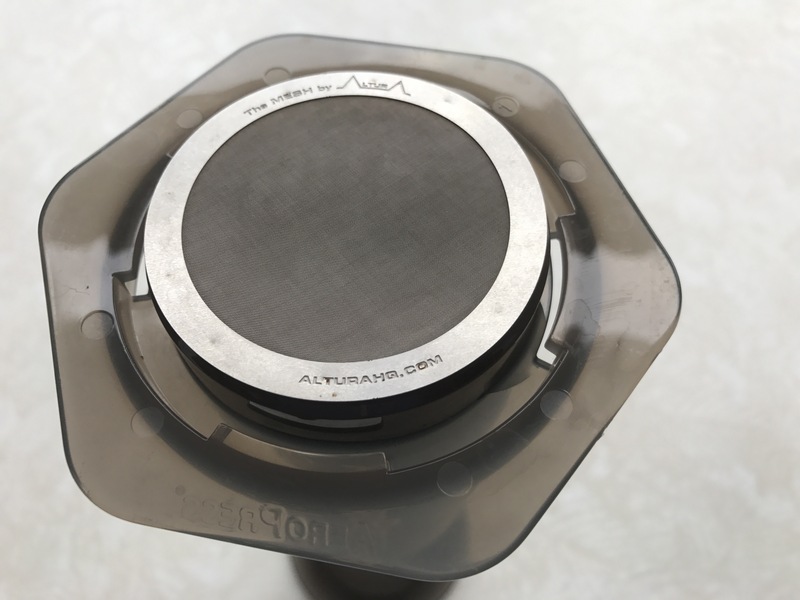 Place the filter and screw cap on the end. As shown below, I’m using a mesh filter. If you’re using paper filters (1 or 2), get it wet with hot water and place directly in your end cap. 5. Flip it all over, placing on your coffee cup in one motion. Be quick! When the sound of dripping coffee changes to air hissing it’s time to stop. A big change is that I’m only getting a 4 oz cup of coffee each morning, but to be honest it hasn’t been an issue. I’ve never drank coffee for quantity and the quality improvement is hard to beat. Blue Bottle Coffee has been on my radar for years. I signed up for a sample and loved it, so I quickly subscribed to get a 12 oz bag every 2 weeks ($19). The difference from the Starbucks beans I was given is unbelievable. If you have any other recommendations, please let me know. Our coffee maker broke this past week and we dug out an old French Press and now we’re snobs — broken for regular coffee. That FP coffee is far better than anything we can make with a run-of-the-mill coffee maker. Nick, I actually teared up a bit reading this. Welcome to the club. You won’t look back. 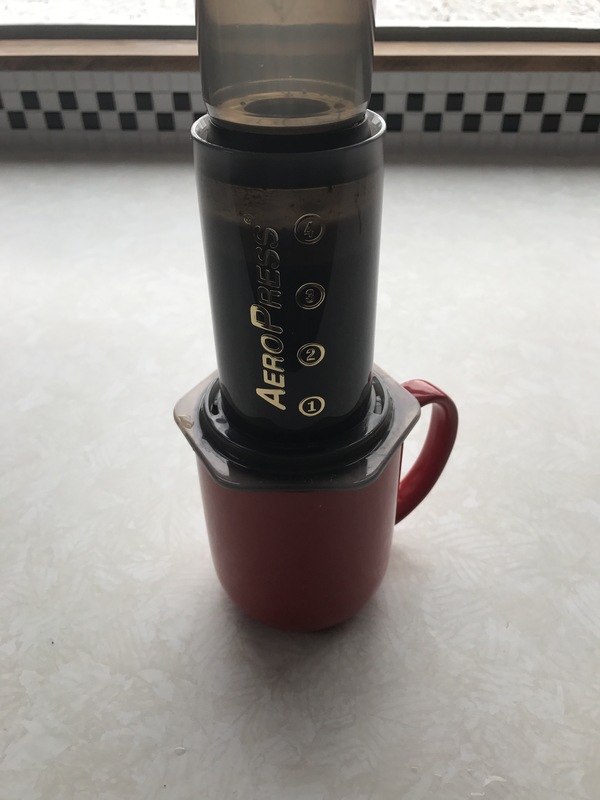 Love my AeroPress. Haven’t tried the inverted method you’re using though—do you see a big difference in taste compared to the standard process? 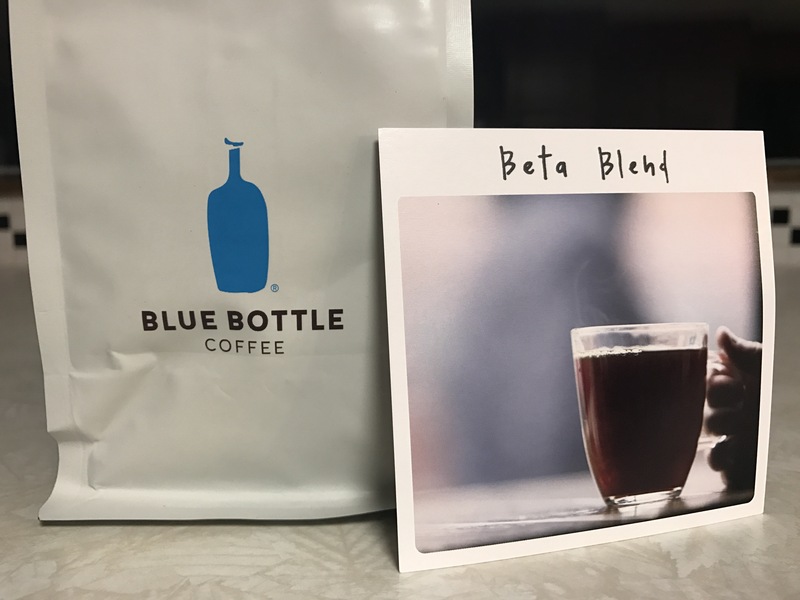 I only tried the regular method once or twice before seeing Blue Bottle recommend the inverted method, so I’m not sure how much of a difference it makes. I use a chemex (http://www.chemexcoffeemaker.com/) which I like a lot. I need to pick up a grinder. I used to have one, and it eventually broke, so I’ve been grinding the fresh beans at the local co-op. I’ve been really happy with Counter Culture coffee (https://counterculturecoffee.com/), which is available locally. Great way to make coffee! I use an almost identical setup. Of all the home coffee methods, this gives the best ratio of cost and mess to quality by far. I got a coffee subscription too, freshly roasted beans delivered regularly. You can really taste the difference when it’s fresh. A little Kopi Luwak for a special occasion is pretty tasty– just make sure you’re getting it from a humane source, there are some pretty nasty farms out there. And once you know about how coffee can, and SHOULD taste, you’re ruined for life. It’s like a drug habit. No, it’s not “like”, it IS a drug habit. Well, way cheaper than heroin…so, what the hell, you pick your battles.